I rode a wave this morning. Thanks Darren. I've been mucking around with Twitter and Facebook lately. There are a few folks who have been using these services to post info about how the surf is. I don't live close to the beach (yet), so I like to see what's happening before I jump into the car and make the trip. the @StokeReport user follows. If my tweet contains "SMLM", stokereport will publish my tweet on stokereport.com (and even pull the image off twitpic it seems, nice!). also, http://greacen.com has that little widgety thing over there on the left. Your browser will pull the image from twitpic and put it onto this page. Guess what? 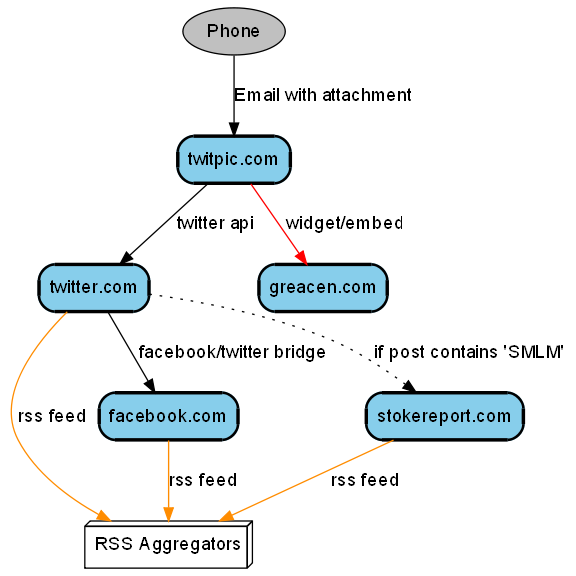 Most of these nodes along the way have their own RSS feeds for others (services or people) to slurp & read. Kinda neat, huh? I find the way this goes from text to sitemap really intriguing. This -> that; that -> next; other -> next; makes sense to me. Graphviz does a great job of putting this all together in an easy-to-digest graphic. There are a few rails front ends to graphviz (demo) that might make a web tool for this possible. I could see this becoming a handy planning tool for our organization. Anyone ever use a tool like this for making sitemaps or high-level flows? What tools work well for modeling these interactions? Has anyone run into ownership issues with this plink-esque publishing? Does this have a name? Let's call it microsyndication. What's the best way to get metrics for this kind of publishing? Is there a way to measure in this distributed/microsyndicated system? How many people read my surf report? We did it. For mishaps during AM surfing, we are now 3 for 3. First, I bonked my jaw on my board and earned an unscheduled trip to the emergency room. The following week, we experienced donutus interruptus due to a work emergency (unscheduled site outage). Today Ryan experienced surfus interruptus when his board split clear in two. No, it wasn't an epic day at Linda Mar. Ryan: Wanna buy a board cheap? Other guy: Looks like you have two boards. Ryan: Today it's 2 for 1. Kinda neat looking in there. No stringer, just air. The aluminum honeycomb is a neat material too. Got a few decent minutes of video from Ryan's waterproof camera on 5/15. There's a good closeup of Marko in there. Music is by blert.